Edelbrock Performer E-Street cylinder heads provide fantastic value for out-of-the-box bolt on performance for engines running up to 5500 rpm. Standard port locations enable use of stock or performance exhausts. We stock these heads fully assembled and ready to bolt on, assembled with valves, seals, valve springs, retainers, keepers, rocker studs and hardened guide plates. Edelbrock E-Street heads are a great way to economicaly improve the performance of engines equipped with original equipment or cast iron heads. Match these heads with a new camshaft for dramatic power increase from idle to 5500 in streetcars. 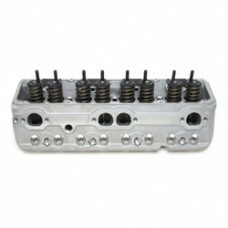 Designed for small block Chevrolet V8 engines these heads have 64cc combustion chamber, 2.02” Intake 1.60” Exhaust valve. Fitted with 3/8” diameter rocker studs. Maximum valve lift .550”. Use intake manifolds EDEL2701 EDEL7101, EDEL5001. Use head bolts ARP1343601. Use head gasket FEL1003 or FEL1010 or FEL1014. Use Intake gasket FEL1205. Use roller rockers e.g. RUK66928C. Must use hardened pushrods. Price is for pair.